In 1969, after the first year of success with the television series, toy manufacturer Mattel issued the first of two Julia dolls which featured a simple twist-and-trun action and came dressed in a white nurses uniform with matching hat and white shoes. Later the same year, Mattel release a more spohisticated second doll that came attired in a sparkling gold and silver sleeveless one-piece jumpsuit spoke and uttered such phrases as "Hi! My name is Julia. ", "Would you like to be an actress?" and "Nursing is great fun." when the string in her back was pulled. Sold separately were several ensembles based on the outfits worn by actress Diahann Carroll on the show, dresses or separates including matching shoes and accessories such as outerwear, purses or hats. 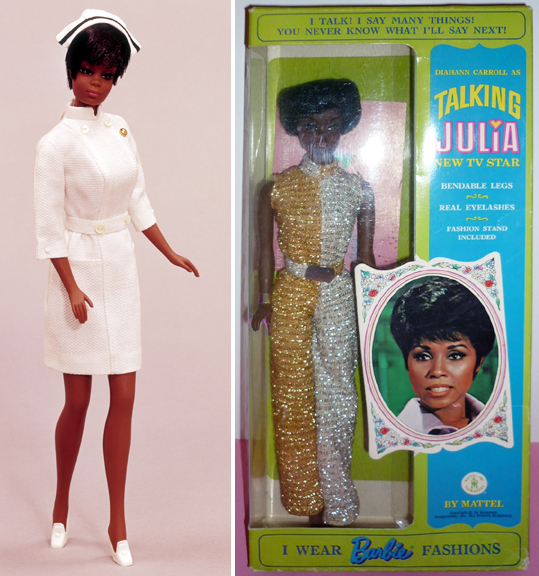 Though the same size at Mattel's other popular dolls, the Julia is one of a few who has her own tagged wardrobe that was specifically designed for her, most certainly with Travilla's input. "Leather Weather" - Red double-breasted coat, pink sleeveless top, red, blue, pink and white plaid mini skirt, red pilgrim shoes and a matching red clutch bag. "Candlelight Capers" - Orange with gold metallic threads knit top, yellow velvet mini skirt with gold braid trim, yellow velvet cape with matching gold trim, faux fur trimmed hat and matching pilgrim shoes. "Pink Fantasy" - Rose tricot gown, lace bodice, sleeveless robe with tiers in three shades of pink with rosette and ribbon tie, gold slippers with rose poufs. Variations on two outfits were also available. Candlelight Capers - Solid gold top, yellow velvet mini skirt with gold braid trim, yellow velvet cape with matching gold trim, faux fur trimmed hat and matching pilgrim shoes. Brrr-Furr Red - White silk sheath bodice with red and white tweed skirt and red belt, matching 3/4 length jacket with faux white fur trim and red vinyl belt, white faux fur hat and white pilgrim shoes. And the "Holy Grail" of outfits would be "Simply Wow" with a blue and white bodice top with blue jacket, both trimmed in gold and matching pilgrim shoes. Only offered with the talking Julia exclusively at Sears. They were very popular with little girls and are still today with collectors. Individual pieces range from $25-75, and complete sets between $150 to $300 with rarer variations commanding upwards of $750 or more in the original unopened packaging. Several variations of paper dolls were also produced during the show's run. Travilla possibly had input on the designs, but certainly not the colors. I mean, that striped top?